1. The best time to travel to Seoul is in the months of late April, May, September, and early October when the weather is comfortably warm and not dry. The flights and hotels typically cost more during the Summer months. 2. No visa required for stay less than 30 days for the citizens of Canada, USA, Western Europe, Australia. But the passport is required for entry. Centrally located in and around the downtown of Seoul, North of the Han River. Near by or walking distance to the shopping districts, restaurants. Metro: Itaewon & Noksapyeong (line 6), Namyeong & Yongsan (line 1), Samgakji (Line 4). The "Foreigner District" which is centrally located just North of the Han River. Minutes away from great restaurants & shopping areas. Strategically, this is the best district to lodge if you are planning to visit throughout Seoul. It is thoroughly covered by the mass transit and never too far from the northern districts like Jongno-gu and Jung-gu, south of the river districts like Gangnam and Apukgjeong, and popular neighborhoods on the west side, Hongdae and Sincheon. Located just outside north of Jung-gu District. * Texting is much cheaper than dialing. Airport bus - Costs about $12.00. Thoroughly covers the city of Seoul. Stops at international or major hotels. If you are staying at a small hotel, write down the address and names of the district/neighborhood/nearest subway station to determine which bus stops near-by. It takes about an hour to get into Seoul. Regular subway train - Costs about $3.00. Many stops and several transfers may be required. Speed subway train - Costs about $12.00. 10 mins faster than the regular train. It travels directly to Seoul Subway Station (Line 1). If your hotel is not near-by, I don't recommend taking this train. Car rental - An international driving license is required. I do not recommend it although all the major traffic signs are written in Korean and English. Driving is a hassle with a heavy traffic and parking options being limited. Grab a map of Seoul written in Korean and English. Save yourself a trip to a tourist office later. * Purchase public transit card at any subway kiosk. Start out with 10,000 won ($10.00 USD). Give the money to the booth personnel and ask for a "car-dd". It can be used for the subway and buses. Recharge as needed. Ask for a subway map. Just say "map" in English. * Seoul's mass transit is very affordable. Bus and subway cost about $1.00 one way. Taxis: Plentiful but most expensive. Tips: Drivers do not navigate the city from the location's address. 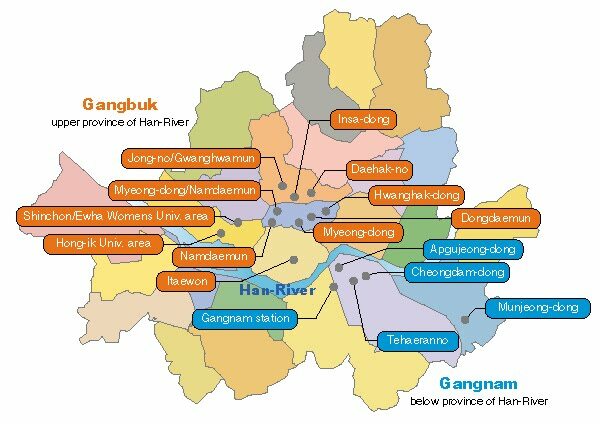 Instead, they use the neighborhood name and near-by well known landmarks such as department stores, universities = day-huck-gyo, museums, subway stations = yuck, hotels = ho-tel, parks = gong-won (as in "magic wand" but no "d"), tourist attractions, shopping districts, etc. Pick up a copy of the city map with these places written in Korean and English. If you get lost, just show the map to your driver. It is not customary to tip the drivers. * All major banks exchange cash and travelers' cheques, but they prefer Euro, US, Canadian, Australian, and British currencies. * Credit cards are widely accepted, but hidden fees may be charged for overseas' usages. Check with the CC company for details. * Most bank cash machines do not accept foreign cards. If you absolutely need quick cash, try to find one at a subway station. Instructions are in Korean. * It is not customary to tip workers at restaurants/bars. * Learn to love Korean food and drinks. Affordable and a better value than the foreign food. * The best way to learn about Korean food is head down to the basement of the department stores or the grocery store "marts". They often have a food court with a variety of Korean food booths to choose from. Peak around and see what looks good. In-sa-dong: A designated neighborhood promoting traditional Korean food & tea. Anguk Station Exit 6. Orange line 3. Explore the main street and the alleys as well. Gawng-nam: Gangnam Station Exits 6 & 7 Green line 2. Explore the alleys. Dong-day-moon: Dongdaemun Stadium Line 4; Exits 8, 4, 9, 10 - Street food. Sam-cheong-dong ( Gyeongbukgung Palace Station Exit 3, Orange line 3) Walk 10-15 mins along the walls of the palace to the starting point of Samcheongdong Street and turn left or ( Anguk Station Exit 2, Orange line 3) walk straight for approx 700 meters. North of Insadong. 6. Night-life: Seoul has a great nocturnal nightlife culture. * Imported liquor, wine or other beverages are extremely overpriced. * Subway trains stop running by midnight and buses by 1am. Taxis are the only option afterward until the public transit is up and running around 5:30am. No-ray-bawng: Korean style karoki. You rent a private singing room. It's very popular in Korea and fun with a group of family/friends. They are charged by hourly or a flat fee. These are often opened til 4-5am. Ask your hotel concierge for a recommendation in your area or in the area that you are planning to visit. Some can be very expensive particularly the ones in the areas Apgujeong and Cheongdahm. Jjim-jil-bawngs (prounced: Jjim-jay-bawng) - Public bathhouses & saunas. Often open 24 hours * birthday suit in the bathing room. Info. Dragon Hill Lodge: In Yongsan. Owned by the US army and caters more to the soldiers & their families and foreigners. Take a taxi. A little more complicated to find. Tell the driver " Young-san, Dragon Hill Lodge Ho-tel"
Casinos: Gambling is illegal for Koreans, but legal for foreigners and Koreans with foreign passports. Make sure to bring your passport. There are 3 locations: http://www.7luck.com/en/Main.aspx: - Gangnam ( Subway Line 2 Samseong Station Exit #5, pass the Hyundai Department Store, then make a right and walk 100 meters to see the casino to your right). Millennium Seoul Hilton Hotel (Line No. 4 to Hoehyeon Station and go out Exit 4, and then walk 200 meters in the direction of Daewoo Foundation Building and take the byway on the left in the direction of the entrance to the parking lot of Seoul Hilton Hotel) and Paradise Walker Hill Casino. < Click for direction. Recommend the following neighborhoods' bars for foreigners: Most bars are open til 2-3 am from Mon-Thurs & Sundays and 3-4 am on Fri & Saturdays. The clubs are open til 5-6am on Thurs, Fri & Saturdays. Club Volume: Night club which specializes in electronic music with guest international headliner DJs on the weekends. Noksapyeong Station (Brown line 6 Exit 3). Walk for about 5-8 minutes heading down a hill and across the street to Capital Hotel. Club is at the next door. Queen: Intimate hole in the wall gay bar which attracts a mixed crowd. Great music & dance crowd. Itaewon Station (Brown line 6 Exit 3) - Walk ahead and pass a fire station, across from Helios Bar. Turn right at the following street. Turn left at the 2nd street and Queen is on the left with big windows. Bricxx Bar: Chilled basement hook-ah lounge with a great vibe. Attracts ex-pat English teachers. Itaewon Station ( Line 6 Exit 1) - Turn right into the first alley street from KFC and walk til it deadends. Turn right and look for the sign on your right. B-1 Bar: Gay bar but attracts a mixed crowd. Basement cocktail lounge with DJ's playing usually on Fri and/or Saturdays. Small dance floor. Itaewon Station (Line 6 Exit 1). Turn right at the first alley passing KFC. Look to your left. Gecko's Garden: Beautiful outdoor terrace. Food is average & overpriced. Info - Itaewon Station Exit 1. Turn right at first alley after KFC. Turn right when it dead-ends. Look for the sign on your left. Bungalow: It has a tiki bar vibe with a rooftop beach. Itaewon Station (Line 6 Exit 2) - Turn left at 1st alley street. Turn right when it deadends. Look for it on your left. The Loft ( Wine Bar): It has a great roof terrace with a chilled indoor decor. Itaewon Station ( Line 6 Exit 3). Walk up and pass a gas station and fire station near the first street. Pass Rocky Mountain Tavern and Sortino Restaurant ( look for an Italian flag hanging). Start looking for the sign. It's on the 2nd floor. note: There is another "drinking" bar called Loft in Itaewon. Luv Superlounge: Small night club with a fantastic line-up of oversea DJs performing on the weekends. Facebook & Info. Itaewon Station ( Line 6 Exit 1)- Turn right at 1st Street after KFC. Turn left when it deadends. It's on your right side. Mu: Trendiest rooftop bar. Itaewon Station ( Line 6, Exit 2): You will see Hamilton Hotel on your left. This bar is located behind the hotel in the alley street. Hong-day (Hongdae): It's located in Hong-ik University town, so it mostly attracts the college student crowds. But there are a few hidden worthy mentions that tend to draw older crowds. A great area to walk around & explore and it has a plenty of bars with cheap drinks. Unknown: Chilled basement hookah lounge with Morccocan decor and ambiance. Direction: Sangsu Station ( Exit 1 Brown line 6): Walk North bound for 3 blocks and turn left at 7/11 Store corner into the alley. Turn left at the 2nd street (Gr8 Hookah Bar). Pass aA Design Museum Cafe (map)on your right and Nabi Bar on your left (Another great hookah bar with a boho vibe. Head to the basement). Start looking for a building with an "Arabic" writing on your right. Head to the basement. ( This bar is such a hidden gem that there is no English or Korean sign on the building). Vinyl Bar - Hongik Station ( Line 2 Exit 5) - Walk ahead and turn left at the 1st street. Walk up til it deadends at Hongik University building. Turn right and walk for 200 meters. Look for the sign. If you pass 7/11 store, you went too far. A great place to enjoy a cocktail or two before heading to the clubs. Sin-cheon: In Ewha University town which may appear rough and scruff but under the surface has a cool laid-back vibe with genuineness. Next door to Hong-dae neighborhood. Nori Bar: Eclectic music & dance crowd in this cozy bar. Location - Sinchon Station Exit 1 Green line 2. Take your 2nd right after Hyundai Department Store. Walk straight and look for the bar on the left side, after passing your 4th left. Head to the basement of 'The Bar". Do not get here before midnight. Gawng-nam (Gang-nam): Hectic & buzzing with neon signs. Although foreigners do hang out here, this district has more Korean appeal than other areas like Itaewon and Hongdae. Rainbow: Hook-ah lounge with a great decor. Gangnam Station Line 2 Exit 6 - Walk 250 meters. Turn left at Giordano Store. Turn right at Dunkin Donuts and it's on your right. You have really shared the great list of top hotels, keep sharing. Welcome you to Cigar Bar San Diego's Coolest and Classiest Cigar Lounge. It's not only a stogie relax, it's an Etiquette. Come in and appreciate a glass of extraordinary wine with your most loved stogie. A different space for Hookah mates with stunning flavors that will fulfill each palette. In any case, more than that appreciates a fun climate, hookah cocktails lounge, and extraordinary time.